Miqat (Arabic: ميقات) refers to the boundary where it becomes necessary for pilgrims to adorn the Ihram garments and impermissible to pass except in the state of Ihram. Those who cross the boundary without having entered into the state of Ihram must perform an animal sacrifice (Damm) as expiation. Allah’s Messenger ﷺ had fixed Dhul Hulayfah as the Miqat for the people of Madinah; al-Juhfah for the people of Sham; and Qarn al-Manazil for the people of Najd; and Yalamlam for the people of Yemen. So, these (above mentioned) are the Mawaqit for all those living in those places, and besides them for those who come through those places with the intention of performing Hajj and Umrah and whoever lives within these places should assume Ihram from his dwelling place, and similarly the people of Makkah can assume Ihram from Makkah. When these two towns (Basra and Kufa) were captured, the people went to Umar and said, “O Chief of the faithful believers! The Prophet ﷺ fixed Qarn as the Miqat for the people of Najd, it is beyond our way and it is difficult for us to pass through it.” He said, “Take as your Miqat a place situated opposite to Qarn on your usual way. So, he fixed Dhat Irq (as their Miqat). Dhul Hulayfah is located 18 kilometres southwest of Masjid al-Nabawi ﷺ in Madinah and is 410 kilometres (255 miles) north of Makkah. This is the Miqat for the people of Madinah and the people (outside of Madinah) intending to perform Hajj by passing beyond this point coming from the North. Al-Juhfah is located 182 kilometres (113 miles) northwest of Makkah. This is the Miqat for people intending to perform Hajj travelling from North America, Europe, Turkey, Syria, Egypt, Algeria, Sudan and several other African countries. 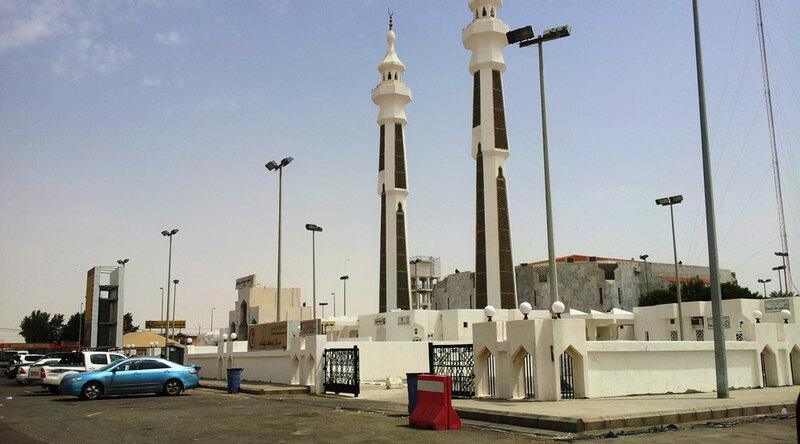 Pilgrims may also enter into Ihram at Rabigh, a town just to the north of al-Juhfah. Qarn al-Manazil is located 80 kilometres (50 miles) east of Makkah. This is the Miqat for the people of Najd and for those travelling from countries such as the U.A.E, Oman, Pakistan, Australia, Malaysia, Singapore etc. It is situated near the city of Ta’if. Dhat Irq is located 90 kilometres (56 miles) northeast of Makkah. This is the Miqat for people intending to perform Hajj travelling from Iraq, Iran, China, Russia etc. Yalamlam is located 100 kilometres (62 miles) south of Makkah. This is the Miqat for the people of Yemen and those coming from the south. Pilgrims travelling from countries such as South Africa, Nigeria etc. will cross this Miqat. The Hil (Arabic: الحل) refers to the area between the boundaries of the Miqats and the boundaries of the Haram. Towns and cities such as Jeddah, Khulais, al-Janun and Taneem are all situated within the Hil area. Pilgrims residing in or travelling through the Hil must enter into a state of Ihram before crossing the boundary of the Haram. For example, a person who travels to Jeddah for business purposes and wants to perform Umrah at a later stage may enter into Ihram in Jeddah or before crossing the boundary of the Haram. If an individual from al-Hil has the intention of entering Makkah for another purpose, such as praying Salah at the Haram or visiting friends or relatives, Ihram won’t be required. If after entering Makkah the individual decides to perform Umrah, Ihram will need to be assumed at the boundary of the Haram. The Haram is the sacred boundary of Makkah within which certain acts are considered unlawful which may be lawful elsewhere. It is prohibited to hunt wild animals, damage plants or trees, graze animals, carry weapons, fight or behave in a manner that will violate the sanctity of Masjid al-Haram. If a violation is carried out within the precinct of the Haram, Damm or Sadaqah is required as expiation. Taneem – Masjid Aisha, also known as Masjid Taneem, located about 8 km (5 miles) from the Kaaba and 5 km (3 miles) away from Makkah, in the direction of Madinah. Adaat Laban – On the road to Yemen, 11 km (7 miles) away from Makkah. Wadi Nakhla – On the road to Iraq, 11 km (7 miles) away from Makkah. Arafat – On the road to Ta’if, close to Masjid al-Namirah in Arafat, 11 km (7 miles) away from Makkah. 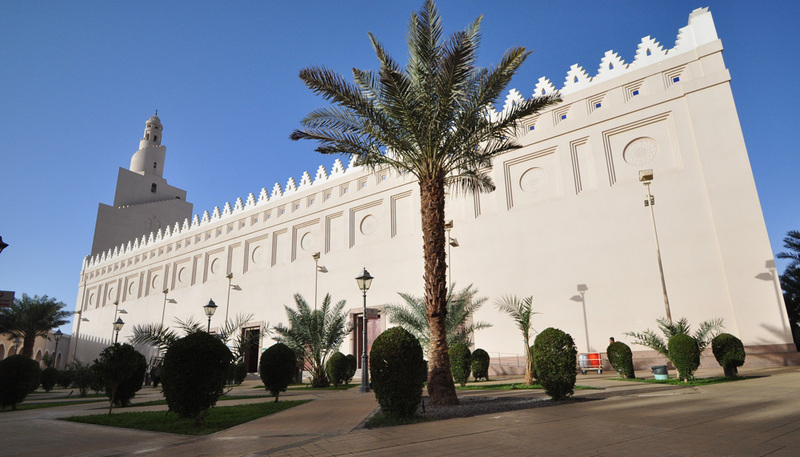 Ji’ranah – Masjid al-Ji’ranah, located about 14 km (9 miles) away from Makkah. 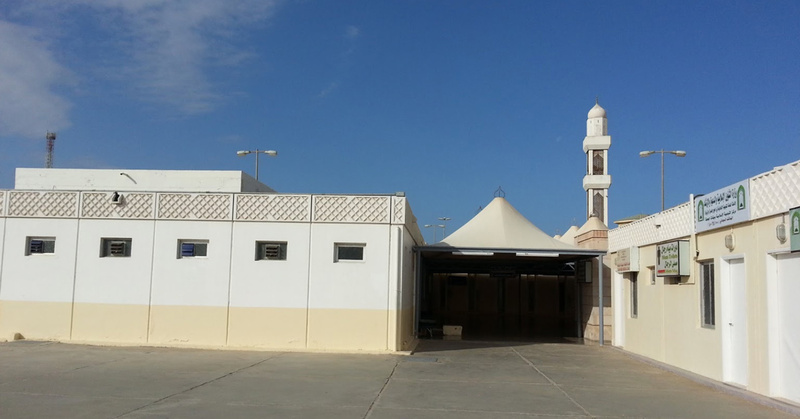 Hudaibiyah – Masjid al-Hudaibiyah, on the road to Jeddah, about 16 km (10 miles) away from Makkah. If a pilgrim intends to perform an additional Umrah, Ihram must be assumed outside the boundary of the Haram before reentering Makkah to carry out the rites of Umrah. Many pilgrims choose to enter into the state of Ihram at Masjid Aisha which is the nearest and most convenient location from Masjid al-Haram. Transportation to get to this location is available near the mosque. Pilgrims intending to go to Madinah before going to Makkah to perform Hajj or Umrah may enter into Ihram at the hotel in Madinah or at the designated Miqat for Madinah, Masjid Dhul Hulayfah. The taxi / coach will stop at Masjid Dhul Hulayfah on the way to Makkah. It is sometimes the case that pilgrims enter into Ihram at Jeddah airport. As this is a violation of Ihram, the pilgrim should travel to the Miqat that was originally designated or travel to the nearest Miqat. The nearest Miqat to Jeddah is al-Juhfah (Rabigh) which is about 160 kilometres (100 miles) away. Alternatively, an animal sacrifice (Damm) should be carried out as expiation. Only residents of Jeddah or those who intend to travel to Jeddah with another intention, such as business or tourism, may enter into Ihram in Jeddah. There has been some disagreement among scholars as to whether or not Jeddah can be used as a Miqat for those performing Hajj or Umrah. As there is a difference of opinion, it is advisable to take the cautious approach so that the rites of Hajj and Umrah can be carried out with certainty. If you’re flying with an airline such as British Airways, there will be no facilities on board where you’ll be able to pray or get changed. Therefore, getting changed into your Ihram at the airport prior to departure is advisable. As the Miqat approaches, the intention to enter into the state of Ihram should be made. If you’re flying with an airline such as Saudia, you will have access to a small prayer area during the course of the flight. About 10 or 20 minutes away from the Miqat, you will be informed by the captain or a message will appear on the screen informing you that the Miqat is approaching. At this point, you should change into your Ihram if you haven’t done so already. If you feel uncomfortable changing into your Ihram on a plane or you feel you may have difficulties in doing so, it is advisable to follow the approach above and wear the Ihram at the airport prior to departure. Upon arriving in Saudi Arabia, you will have to go through a number of procedures at the airport before being allowed to make your way to Makkah or Madinah.